Nothing demonstrates that more emphatically than this research piece from Asymco. While growth is great, assuming the same run rate it would take Apple another 15 more years to approach Bing’s market share in search. 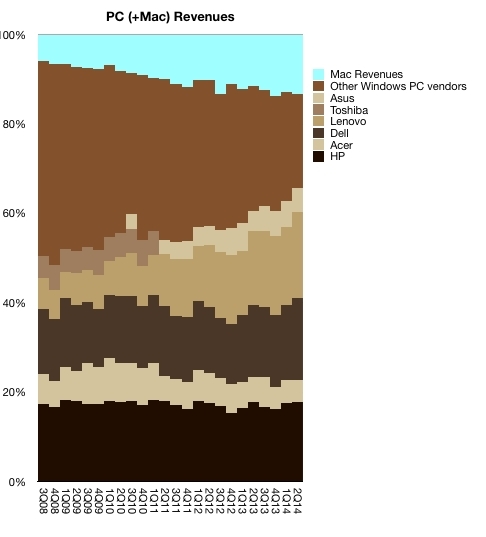 In terms of shipments, Macs are clearly in the minority. Revenue is a better indicator for demand than shipments because it takes into account the higher amount of value customers ascribe to each Mac, as seen in Macs’ higher price. Revenue = shipments x price. This is where product quality, Apple’s premium brand, slick commercials, PR hype and rabid Apple fans play their part. These drive revenue. That’s often what we associate most with Apple’s success. But that’s not what’s most amazing about Apple. 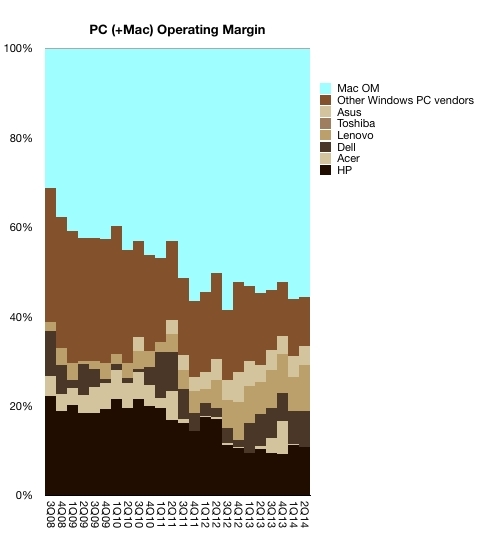 Apple makes more operating profit than all other PC manufacturers combined. Wow. Credit Tim Cook for his incredible work in driving efficiencies in the supply chain. Steve Jobs gets much of the recognition for Apple’s meteoric rise, and his (and Jony Ive’s) impeccable taste translates to market demand; but it is Cook’s management that enables Mac’s fat operating margins. In the case of the Mac, Cook’s contribution is arguably more significant. Credit the product team for not wasting energy on form factors that don’t work. Every year, MacBook Airs and Pros build on top of the previous year’s designs; these incremental improvements are more efficient than PC makers’ efforts to constantly revamp their product lines in search of their own MacBook. Credit the marketing team for finding the right combination of features. While PC laptop makers in the Ultrabook category pushed higher resolution screens, Apple stubbornly stuck to mediocre displays in the MacBook Air to get better battery life. The market has delivered its verdict: they prefer Apple’s approach, one which happens to be highly profitable for Apple.